Good morning, dearest friends. Our hearts feel great joy as each of you reach out and connect with us. May this day and every day be increasingly joyful and special for you, as well. Uploaded 2c October 2012 by pearls2u It is so very interesting to watch the syncs that occur with the Law of Attraction & Magnetics. It is becoming more and more prevelant as so many of us live life through the energies of our hearts. The syncs abound from that point on. WE each are affecting the whole of the multiverse as we go through our personal ascension process. Since we are all that is, and connected to all that is, we cannot help but to do that. Here is an attempt trying to describe that I am witnessing occur. LOVE! 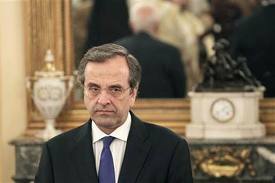 Greek Prime Minister Samaras has brokered a deal that is no deal at all. A major realignment of Parties in Greece is now on the cards.